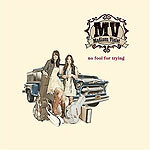 Turbula - Music - Review of "No Fool for Trying"
Madison Violet, formerly Mad Violet, are a Canadian acoustic alt-country female duo who have released an EP and two previous full-length CDs, including "Caravan" in 2006. ‘No Fool for Trying’ is the new one from singer/songwriters Lisa MacIsaac and Brenley MacEachern. The all-original music is a blend of Americana styles that draws in some bluegrass influence, folk and prominent, pristine tight country harmonies, all over the top of quiet acoustic instrumentation. Both are capable singers, lead vocals for the most part are by MacEachern, who has a hint of Dolly Parton in her delivery. The duo has toured with the Indigo Girls, and shares their sound and approach; on some of the material, think of Nickel Creek if Allison Krauss or Parton sat in. The songwriting is the key in this laid-back setting, and several of the tracks stand out. "Lauralee" is a lively bluegrass tune with tradeoff vocals, and the title cut follows and scores well also, with a similar pace but more of a folk arrangement, built around nice mandolin touches. "Small of My Heart" is a slow lament that works despite a distracting guitar lick at the intro, sampled from a scratchy vinyl record. While the rest includes country and folk ballads galore, "Baby in the Black and White" makes an impression as a dark, stirring jailhouse tale. The jewel of the disc is a single cut, "Crying," which uses superb harmonies to punch home a good lick on a pleasant country shuffle. "No Fool for Trying" is interesting acoustic music, with excellent vocals, and some memorable original songs. It should help Madison Violet expand their following in the U.S.